Yes..... I counted them all. And it only took about three hours to Cornrow her hair. She is the most patient 4 year old I know. 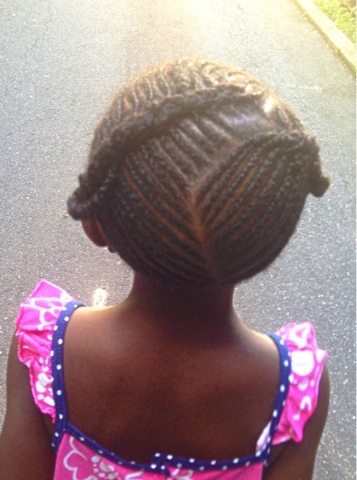 Her hair was washed and deep conditioned three days before and was left in four threaded plaits. 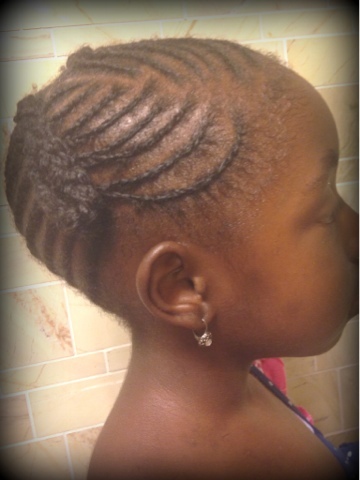 This really stretched her hair out and it was soooo easy to Cornrow her hair. I used Shea moisture growth milk for fine hair to moisturize each section and sealed with Shea butter and coconut oil. 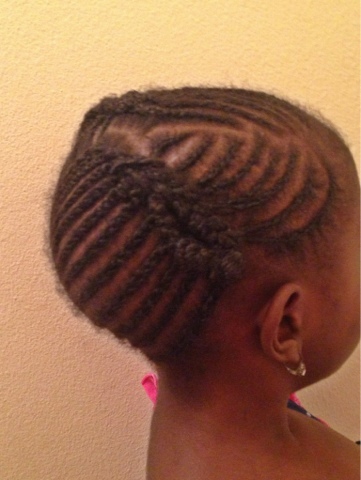 The ends of the cornrows were two-strand twisted. I never finish the ends of her cornrows with braids. It would be a big headache to take those things out. 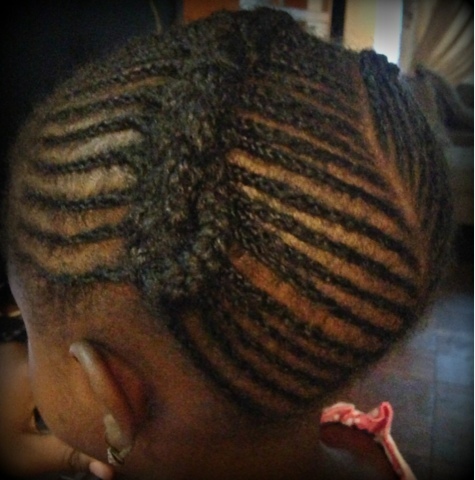 Once I was finished with all the cornrows, I gathered the ends of each side, and cornrowed them down towards her ears. I threaded the very end of each big Cornrow and looped the threaded end under the big Cornrow. I try not to use pins because I am concerned about the pin poking her scalp. So, if you are wondering why I made so many cornrows, it's because 1). She is back to school tomorrow and 2). I needed a style that should last for the entire month. 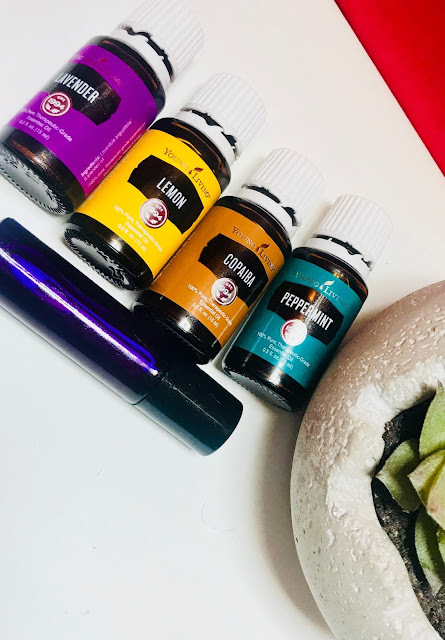 Her hair will be lightly misted with aloe Vera juice about twice a week. At night, it will be tied down with a scarf. She uses satin pillow case anyway if her scarf comes off. Aww...thanks so much. I know..it takes a lot of patience with the little ones. But u can do it. There was a time I could not cornrow at all. Aww, Little L's hair is too cute. Is she excited about school? Yes sis and Thank you! She has always loved school. That girl is a social butterfly. Everyone loves her. 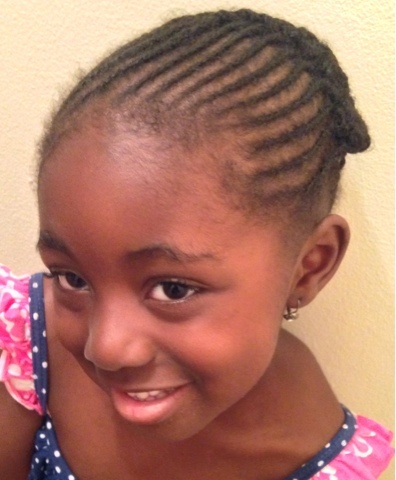 I'm a new visitor to your site, and my daughter (3 nearly 4) has painfully thin hair. 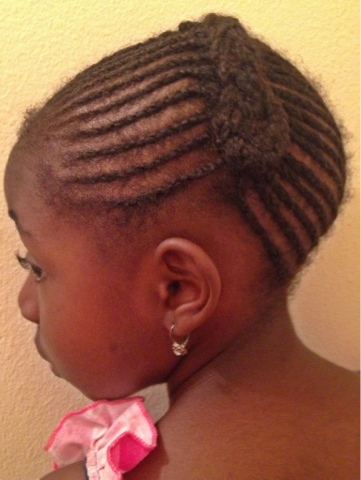 She was bald for the first 2 years of her life, sporting a mohawk like baby hair frizz on her crown. Your daughter's progress is encouraging because my daughter's hair is about as thick as your daughter's was when she was 2ish. I'd be happy for her to have this much cover by the time she's six. How do you avoid pulling her hair too tight though, when it's so thin? 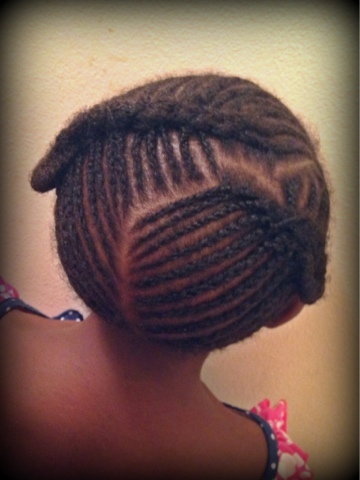 I can pretty much only do flat twists on her hair, and thus have to redo them weekly. Any suggestions?